Bottles of 100 ml, which are individually packed in cardboard packs with instructions for use. It has regenerating, antioxidant properties and contributes to the removal of intoxication. Hepasafe plus as active ingredients in 1 ml contains silymarin - 40 mg, vitamin E - 5 mg, methionine - 4 mg, excipients lactulose - 20 mg and purified water to 1 ml. Hepasafe plus refers to hepatoprotective drugs. The active ingredients in the preparation improve the functional state of the liver, contribute to the protection and restoration of the structure of hepatocytes; normalize the level of ammonia and accelerate the regeneration of liver cells. Silymarin has a regenerating, hepatoprotective, detoxifying effect, protects the liver tissue in various toxic lesions, helps restore the function and structure of liver cells. Vitamin E inhibits the development of free radical reactions, prevents the formation of peroxides that damage cellular and subcellular membranes. Methionine is an essential amino acid for the body. It has a hepatoprotective effect. It activates the action of hormones, vitamins and enzymes, reduces the concentration of cholesterol in the blood and increases the content of phospholipids. Hepasafe plus is prescribed to dogs independently or as part of a complex therapy for the treatment and prevention of acute and chronic liver diseases of various etiologies (hepatitis, cirrhosis, degeneration and fatty liver, correction of lipid metabolism disorders), including infectious, invasive diseases, and to reduce the hepatotoxic effects of chemotherapeutic drugs. Contraindications to the use of the drug Hepasafe plus is the individual hypersensitivity of the animal to the components of the drug. 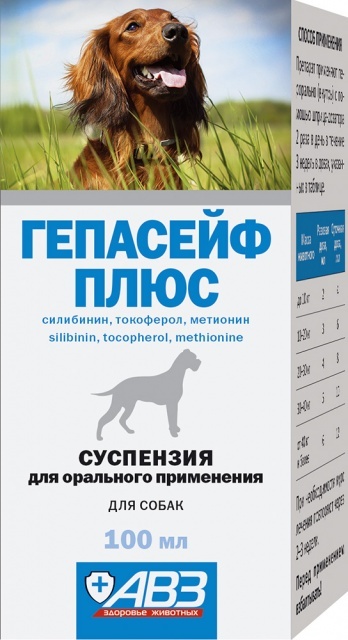 Hepasafe plus is prescribed to dogs and cats independently or as part of complex therapy for the treatment and prevention of acute and chronic liver diseases of various etiologies (hepatitis, cirrhosis, degeneration and fatty degeneration of the liver, correction of lipid metabolism disorders), including infectious, invasive diseases, and also to reduce the hepatotoxic effects of chemotherapeutic drugs. Do not use the drug in animals with increased individual sensitivity to the components of the drug. If necessary, repeat the treatment after 2 to 3 weeks. Before use, the suspension is recommended to shake. Symptoms of overdose when using the drug is not installed. Features of the drug at its first use and cancellation was not detected. It is necessary to avoid violations of the scheme of use of the drug, as this may lead to a decrease in its effectiveness. In case of missing a single dose of a medicinal product, the course of application should be resumed as soon as possible in the prescribed dosages and regimen of administration. Side effects and complications in dogs and cats with the use of Hepasafe plus in accordance with this instruction is not installed. In rare cases (in cats), after use of the drug, hypersalivation may occur. In the event of an allergic reaction, the use of the drug is stopped and antihistaminic and symptomatic agents are prescribed to the animal. Hepasafe plus is compatible with drugs, feed and feed additives. Hepasafe plus is not intended for use by productive animals. Side effects and complications in the use of the drug Hepasafe plus in accordance with the instructions, as a rule, is not observed. With increased individual sensitivity to the drug and the manifestation of allergic reactions, the use of the drug is stopped and, if necessary, antihistamines and symptomatic therapy are prescribed to the animal. Hepasafe plus is stored in the closed packaging of the manufacturer, in a dry place, protected from direct sunlight, separately from food and feed, at a temperature of 5 ° C to 25 ° C.
The shelf life of the drug under storage conditions is 2 years from the date of manufacture. After the first opening, the drug can be used for 30 days. They produce Hepasafe plus packaged in glass bottles of dark glass, 10 ml each, which are individually packed in cardboard boxes together with instructions for use.